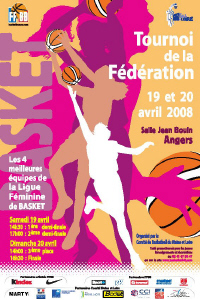 The Tournoi de la Fédération, as it is known locally, does not carry a EuroLeague ticket for the winner as it has done in the last few seasons. This changes the whole concept of this competition as the draw is exactly the same as the championship play-off which kicks off on the 26 April. The venue for the competition changes every season and Angers won the right to host it this time around. Unlike last season the games will not be streamed live on the internet. The format of the competition is simple: The semi-final will take place on Saturday, 19 April and the third place match and final on Sunday, 20 April. Bourges Basket take on Villeneuve d'Ascq while USVO play Montpellier on Saturday. The winner of each game will play each other in the final on Sunday while the losers play for bronze. Villeneuve d'Ascq are participating for the third time in this competition. They have finished fourth on both occasions and are yet to win a match in the end of season festival. Montpellier are back for the second time. They won a bronze medal last season. Bourges have won this cup a total of six times and are looking at retaining it for the third consecutive year. They beat USVO in a pulsating game last year that went to overtime. Céline Dumerc hit the deciding shot with a three-pointer floater over the head of the unlucky Sandrine Gruda. Dumerc top scored in that game with 26 points as she got the better of Kristi Harrower. Bourges have ever been present in the completion since their first participation in 1995 and have only failed once in 2004 not to leave with at least a medal. USVO have won the trophy on eight occasions and have played in all finals since 2001. They have also been ever present since 1996 but also played in the competition between 1992-1994. Challes-les-Eaux won the very first Federation Cup in 1991 and won it again in 1993. Tarbes are the only other club to hold the trophy when they beat Bourges (73-72) with Teresa Edwards scoring 28 points and winning the MVP honours. Only two other clubs have ever won this competition: Challes-les-Eaux on two occasions and Tarbes once.